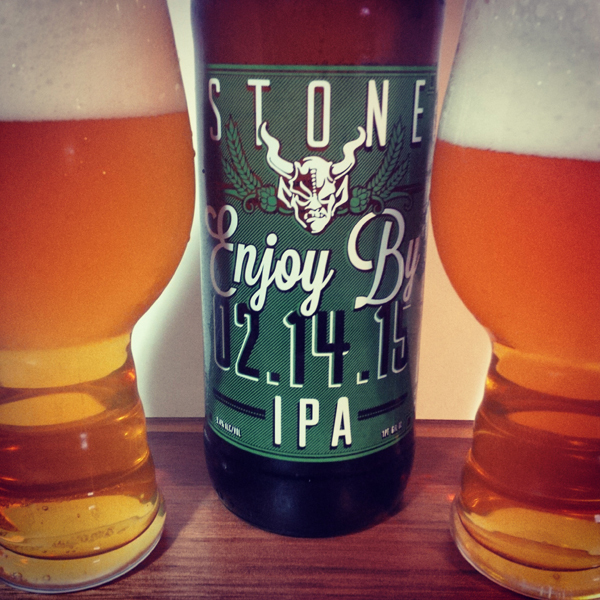 Stone Enjoy By 02-14-15 IPA: Yes, finally the Stone Brewing Enjoy By series has made it into British Columbia with a $10 price tag which is about right for the market, albeit almost a joke because it hit shelves like 3 days before it technically expires (we all blame our Liquor Distribution Board for this). This Imperial IPA is intended to be consumed as fresh as possible, within 5 weeks of the bottling date (bottled Jan 9, 2015). I picked mine up on Valentines Day right on the Enjoy By Feb 14th date and split it with my wife that very same day. This craft beer is brewed to a strength of 9.4% abv and shows just how darn bold Stone Brewery is with their attitude by making the label itself the expiry date which is pretty cool. They are by far the market leader when it comes to beer freshness. Aroma and Appearance: It pours a clear golden colour with some very slow rising bubbles and two fingers of foam. The aroma is peaches, passion fruit, caramel, tangerine, a general floral overtone and very juicy freshness. Flavour: Caramel, apricots and passion fruit up front with some biscuit malt, orange juice and peach skin in the middle. It finishes with a floral and grapefruit bitterness that is near perfect, without a hint of booze or sweetness to mess it up. Overall Impression: Certainly not my first of the Enjoy By series and definitely not my last bottle as they slightly mix up the recipe every batch. This particular one was a great bottle to share with my sweetheart! Rating: Excellent 8.5/10, I think fresh off the line this would be rated even higher. Food Pairing: Grill up a peppercorn filet mignon or other tasty steak with this beer, its light malts and fruity hops will work well with the spices and caramelized meat. Here’s some information about this series in a video they made when they launched the series in 2012, talking about the distribution model and how to make it come back to your State or Province. It was awfully tasty. I also purchased a bottle (actually 2) on the bottle date. Super tasty! Hopefully the liquor distribution branch can smarten up and make this flow better through the border.